The new Diablo 2 Fallen Mod! Sacred 3: Another Trailer! Slow Motion Gameplay! This is a Slow Motion version of the Sacred 3 Gameplay trailer released March 19th which emphasizes the gameplay aspect of the trailer in all its glory! Sacred 3 Official Trailer Released! Deep Silver has announced action role-playing game Sacred 3 will be released this summer on PC, PlayStation 3 and Xbox 360! Sacred 3 will feature classical hack and slash combat and drop-in, drop-out online and offline co-op. The game will support two players offline, and four online. Character classes will include the franchise's trademark Seraphim, The Ancarian, Khukuhru and the Safiri, while introducing a new class, the Malakhim. Check it out all out at DarkMatters/SacredWiki! Sacred 3.org - New Portal! August 16th/10 The new portal page for SacredWiki and DarkMatters is here! Nickolas James, a member at DarkMatters, recruited to create the new site,stormed through the setup and webmastered the new portal to life in a few days with a few special finishing touches by Schot. 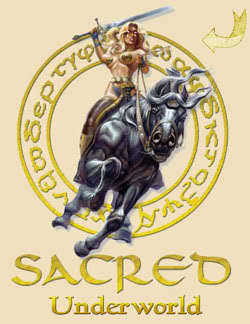 Visit the new portal here at Sacred3.org! Sacred 3 planning announced! August 21st/09 Anca, from the Sacred International Forum has just announced that Deep Silver owns the brand and are planning on creating Sacred 3. 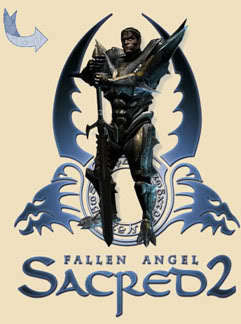 SacredWiki:News/Sacred 2 Ascaron Double Feature! Patch 2.34 and Ladder December 17th/08 The new patch has just been released along with a brand new Christmas Island Quest, winter zone, new sets for all classes and new enemies. Read more about it here. You can also read the complete walk through guide with all pix and information regarding all new available sets, landscape and enemies here on SacredWiki. Get your own snowball thrower now before they all melt away! Secondary Damage Effects are a powerful way to enhance your build. By using damage converters like a Poison Fang and skills like Damage Lore you can boost your combat arts with devastating effects. But watch out - enemies can also cause these effects to you, so learn how to guard yourself! Make sure you're protected with modifiers like Detrimental Magic Effects -X% and don't forget to chug a Recovery Elixir! After the tremendous nerf to +All Skills and Deathblow, the challenge, after the release of Ice and Blood, was to create a purely magical build with no weapon lores or weapon combat arts that would be able to hammer down guardians while weathering their devastating assaults. You can socket runes for important secondary effects that stack? The more runes you read, the less that will drop as the game progresses? You can defeat a group of Region Bosses if the kill counter reaches 999? Ghost Meadow, if cast on another player, can reduce regeneration of their Combat Arts?? There is actually a unique axe that has 1 green socket? The daemon is the only character who can't use the trading skill? Skeleton skulls can be socketed into weapons and armor in Single Player Mode? The Pure Water quest rewards you with a whiskey barrel that you can sell repeatedly? Because seraphim CA's are mostly magic based, they make excellent undead killers? Everytime you load up the Sacred game a new random Silly Message will appear? Cataract of Agility will actually increase the Battle Mage's casting speed? Mounts (Horses) in Sacred are another way of adding more healthpoints to your character? While the Dwarf cannot use a horse, he can run up to a speed of 260? The Vampiress can raise one of her freshly killed dragons to fight for her? This page was last modified on 10 September 2017, at 09:20.